This post is now locked due to a lot of off-topic or very tangentially related issues being posted here. It's so large that it is pretty hard to find/triage issues listed. 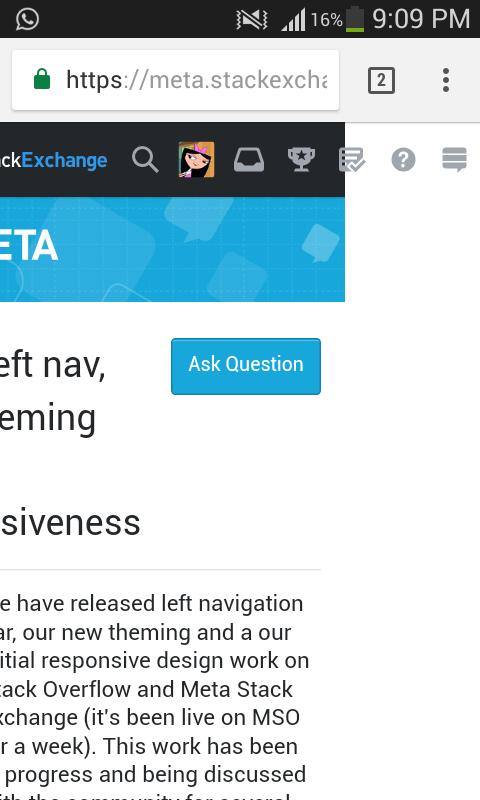 If you have a concern related to left nav, theming and/or responsiveness, then I'd encourage you to post them as a question on MSE or on the meta of the specific site you're concerned with. 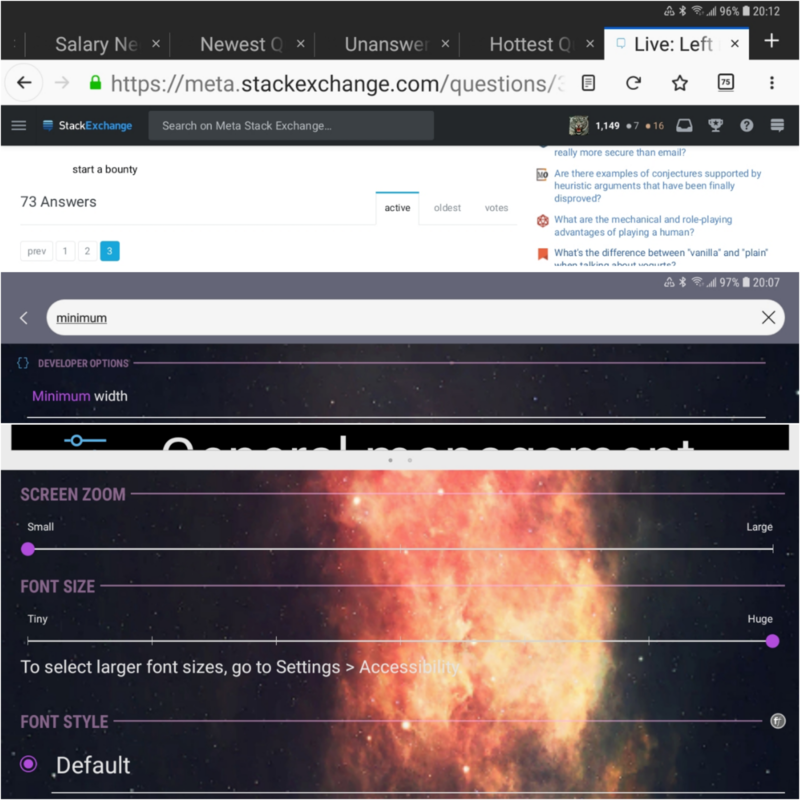 We have released left navigation bar, our new theming and a our initial responsive design work on Stack Overflow and Meta Stack Exchange (it's been live on MSO for a week). This work has been in progress and being discussed with the community for several months. The motivation for the work is covered in my post entitled Ch-ch-ch-changes: Left nav, responsive design, & themes, so check that out if you have any questions about why this work is important. 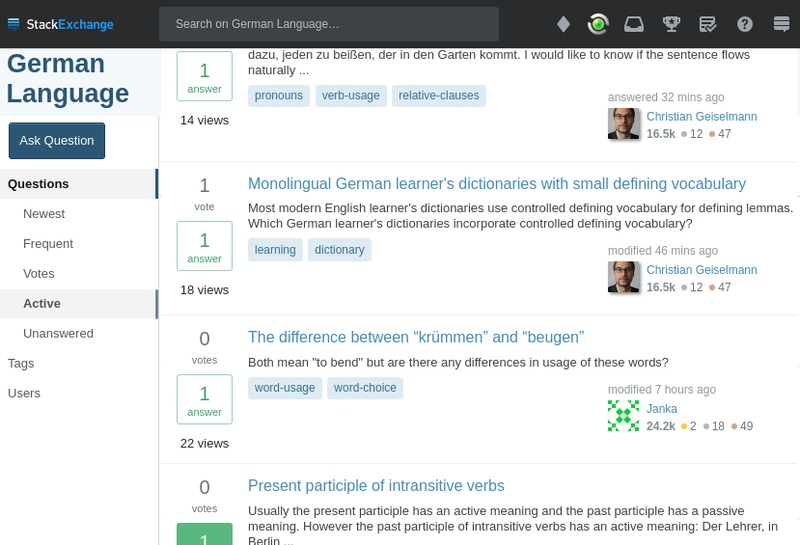 Check out the new left navigation and new theme (most relevant to MSE). This work creates greater experience consistency across the Q&A sites and will increase in the velocity of bug fixes, improvements and new features to all sites thanks to a fully unified code base. Based on early feedback from our initial announcement we've added a preference to unpin the left nav so it doesn't take up space. Just head on down to your local preferences and check the box. Many of the most used pages on the site are now responsive to your window size. This benefits people who have lower resolution devices or like to have multiple windows in view. 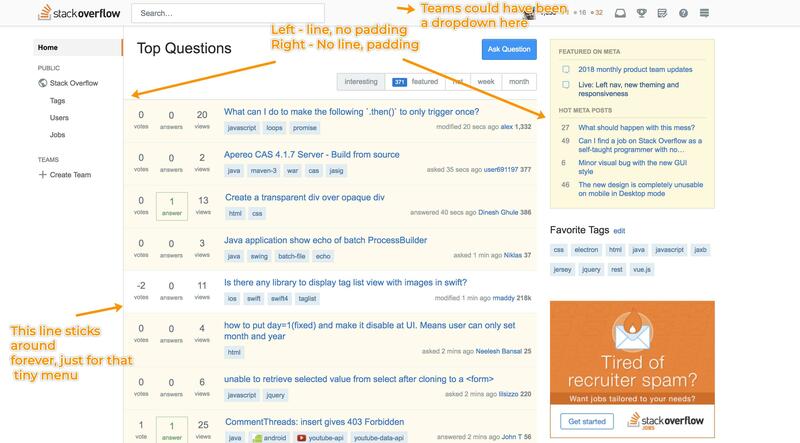 This functionality has been live for a few weeks for Stack Overflow for Teams users. 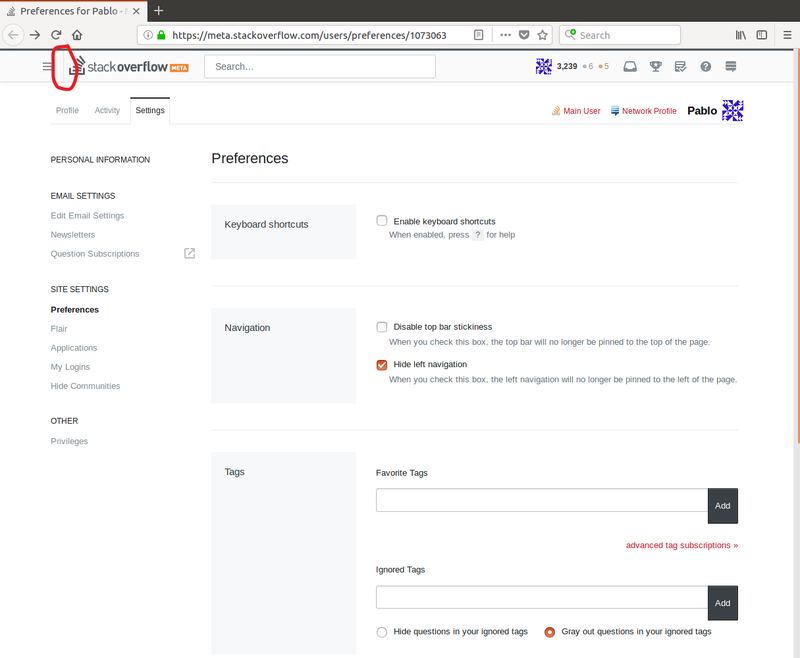 This is a work in progress and this step is a part of our effort to validate our significant changes to page layout code. Not all pages are responsive yet, asking a question and many moderator or review activities will not work in a smaller viewport and you'll need to expand the window. We are making improvements to this experience week by week, so it will just keep getting better. We haven't fully optimized this for mobile devices, but click the "full site" option in the footer and you will get the responsive design on your phone. If for some reason you need access to the non-responsive version, we have a temporary feature for turning that on. Just click "Disable Responsive" option in the footer. This is a temporary feature that will go away once all the pages/features have been made responsive. The mobile optimized view will also remain in place until we finish making all the changes. You can read more about the ins and outs in Responsive design is enabled for Teams users. When is this coming to other sites? August - September: release to the remaining sites. As we have more details we will update individual communities in their local meta. If you encounter a bug or a usability problem feel free to post it on MSE. We are eager to make updates so that this rollout goes smoothly for all communities. Can we please have the right widget collapsible? Not via a checkbox in preferences, but with a button near it (you know, splitter panel style). 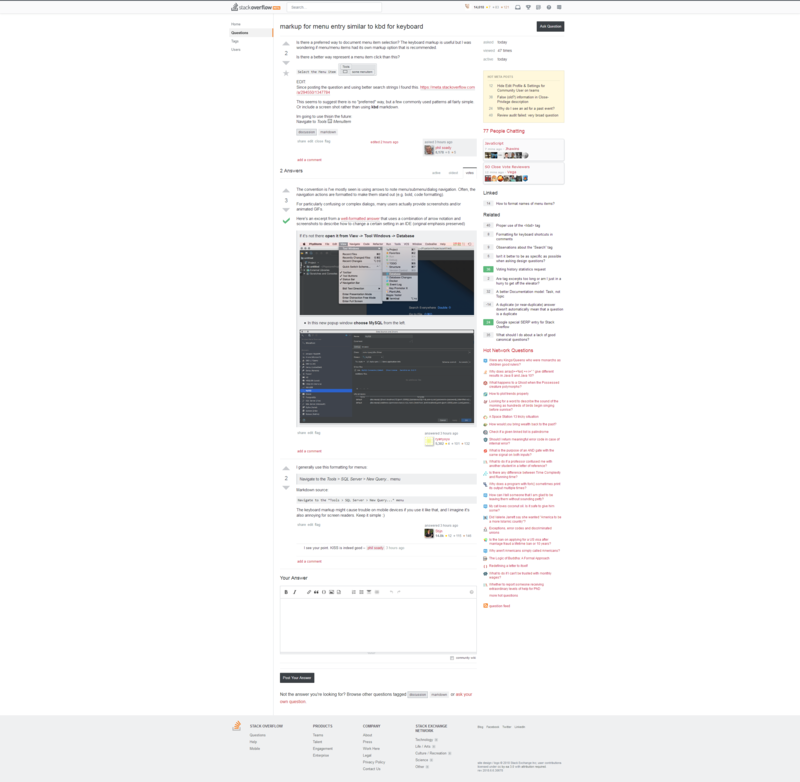 I like to have 2 windows open on a FullHD monitor, snapped to half of the screen each, and the site looks bogus when you disable the left nav bar - a huge chunk of vertical space is eaten up by the right widget with hot questions and related posts. I'd like to be able to collapse it, and not rely on automatic windows width-based layout auto-adjustment logic. bug Also, the profile page doesn't auto-adjust itself to fit the window at half-FullHD width. There's way too much horizontal scroll to take it seriously as it is now. 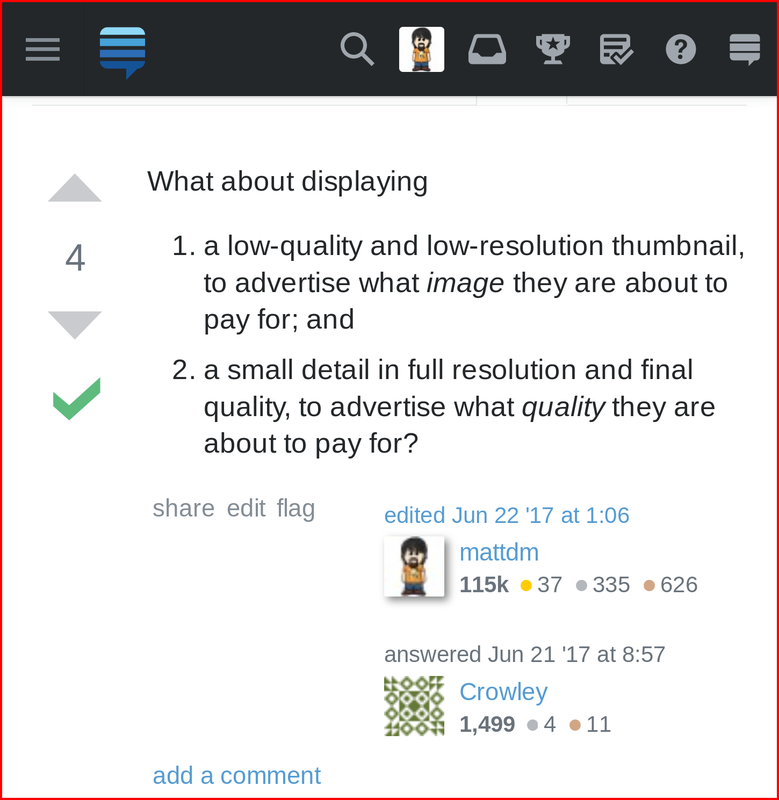 I understand that the new design may be good and necessary for some users, but it is really annoying for me, whatever my settings, to have to either press the menu button or to scroll to the top of the page before I can press of questions, tags or users. Could we have a preference option to get back the old top bar, please? You could e.g. literally cut it in half just by moving the bottom row into the middle of the top row. 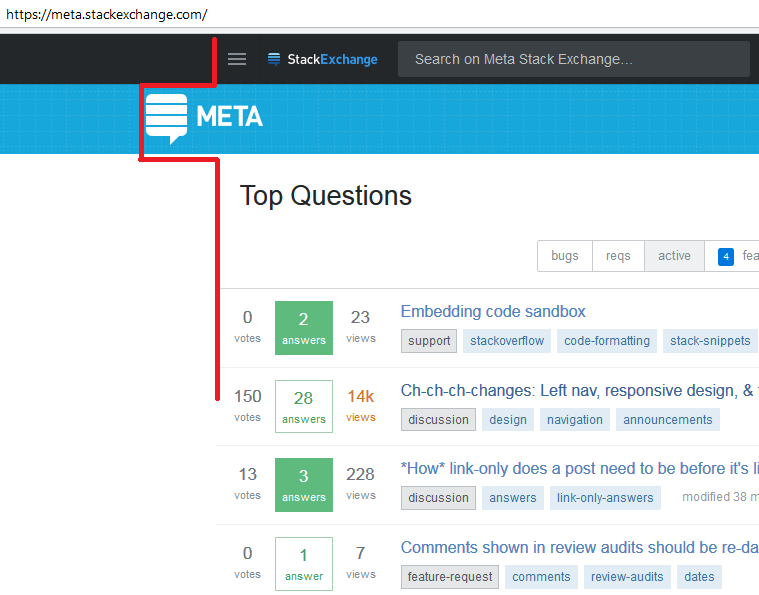 After checked the "Hide left navigation" option in the preferences, the Meta Stack Exchange site header container is not aligned with it's top and bottom div. Can be the <img src add with some spacing to align with the top and bottom divs when hide the left navigation. I had to disable the left nav bar on both SO and this Meta. Does this setting really need to be on a per-site basis? Can't it be that disabling the nav bar is a global setting accross the whole network? 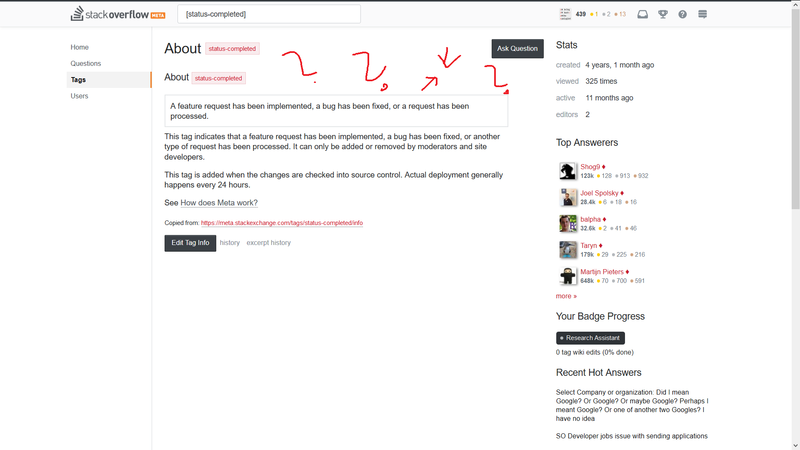 Can you please add the tabination to the about-tag-page? 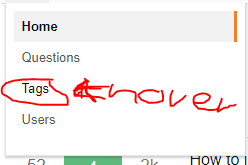 Can we have an option to make the new sidebar sticky? The top icons - inbox, achievements, review, etc are overflowing. I have to side scroll to see them. This is on mobile. Samsung Galaxy Trend S-75whatever, Chrome, Android 4.2.2. Now that this is live, and I can't turn it off, I'll repeat my earlier disappointments. The left nav bar takes up entirely too much real estate for mostly useless links. I thought hiding the bar would help things, and now that it's live, I can see some problems with the approach. Most of the left nav links are infrequently used. The "Questions" link, however, is probably my MOST frequently used link, and making that a two step process is really annoying. Also, the "opt-out" for hiding the menu, and turning it into a hamburger, is sort of a secret. How is a new user supposed to know about this?? Even if a new user figures it out, the links that live under the hamburger are a mystery!! There isn't even a drop down on mouseover that would give someone not in on how the page works a clue about what's under there. A user should not have to know how a web site works to figure out how to use it. So, where does that leave us?? I feel like I'm working with a UI that's significantly less functional than that UI I used to have. I'm not a web person, so I can't even pretend to understand (or, frankly, care) why the change was necessary. The amazing thing is that just about all of the flaws were pointed out after about two minutes of beta!! This stuff should have been dealt with, instead of simply badly patched. It demonstrates not just a difference of opinions, but poor process. As a last note, I'll add that this is SE, and the people here have a reputation of knowing what they're doing. I can't help but feel that a backward step like this hurts the brand. The ability to have "Disable top bar stickiness" unchecked and "Hide left navigation" checked is a wonderful feature. It keeps things similar to the way they are now. Go to Settings and set your Font size to huge. Go to "Developer Options", or use the 'Search Bar' and type "minimum". Set the "Minimum Width" to 980. 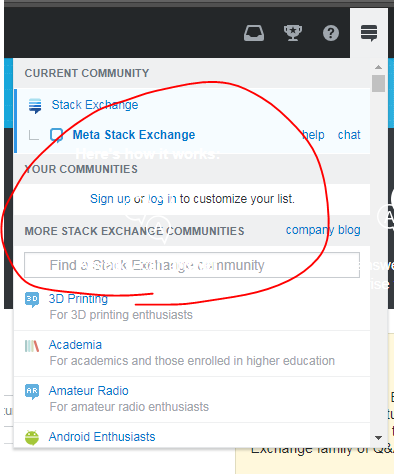 The result on a mobile phone is difficult to use; but the StackExchange site shows your Avatar, Reputation, and Badges (the same as a few months ago). On a large tablet it might be OK (untested) but on a phone the keyboard is especially tiny (could probably adjust that in the APP) and other APPs may appear different. The phone's UI doesn't expect this and things are tiny with incorrect spacing. Many things don't look very good, I set it back the way it was and will simply visit my SE Profile if I'm curious while we wait for this to be fixed. Probably not useful on a phone, someone whom is eagle eyed might prefer this. I thought I'd mention this in case it helps someone. This seems unrelated to Teams/Channels and thus seems to be an inconsistency in a UI overhaul that strives to largely unify the experience on the various SE sites. The left pane adds very little to the functionality of the site, but it takes away much. SO design thus far has had a airy, open design. This left nav (especially the border line running through the page top to bottom) makes for a claustrophobic feel, and content feels quite boxed in. The Nav links were far functional at the top of the page. The teams could have very well been placed up there in the top nav as a dropdown. Do you expect that users will have a long list of teams? Does a user keep looking at the list of teams always even though only one is maybe selected right now? This was taken at 1000px x 676px. On question pages that have the "x questions" text, the row of buttons overlaps the featured box if the window is nearly at the point where the responsive style switches, but not quite there. On mobile, username and picture of editors shown before authors, making it easy to assume wrong author if you don't look closely. If you just skim and don't carefully look for "edited" or "answered", it's easy to assume that the first person listed is the one primarily associated with the answer. This should probably go the other way around. I keep making this mistake both on questions and answers. I think this is a significant usability problem. 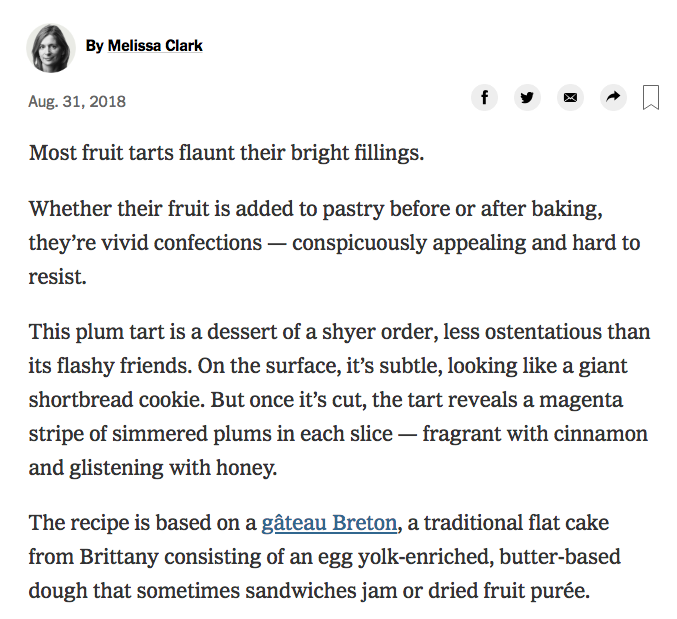 We already have some confusion over this with new users mistaking the editor for the author — now we're going to have that for everyone. 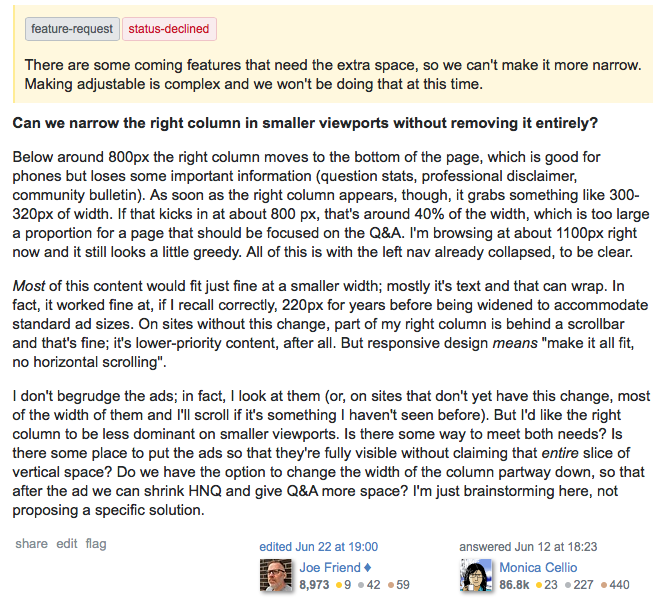 Simply swapping the two would be a big help, but I think it should go even further — maybe don't show the user pic for the editor, or make it smaller somehow. Late to the party but now as the theme went live on my favorite site (Ask Ubuntu) there are issues beyond of what I feared. This was already an issue with the old design but it sadly could not be improved with the new theme. The left side menu is a great thing. I like it a lot but it needs to hold many more items than now. Much of the top bar items could reside there. 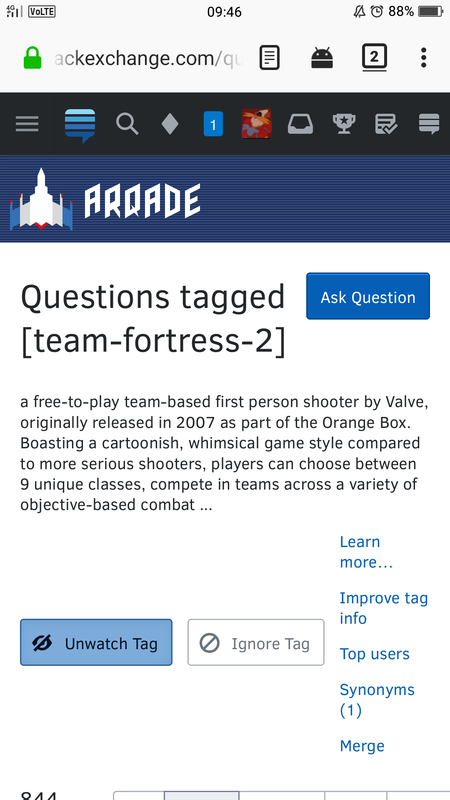 Move the broad top bar with the site logo to the side menu to keep it sticky so that we still know on which site we are when scrolling down through questions. Leave Beta on the non-sticky colored top bar which would move away on scrolling to have the site logo small enough to fit the side menu. 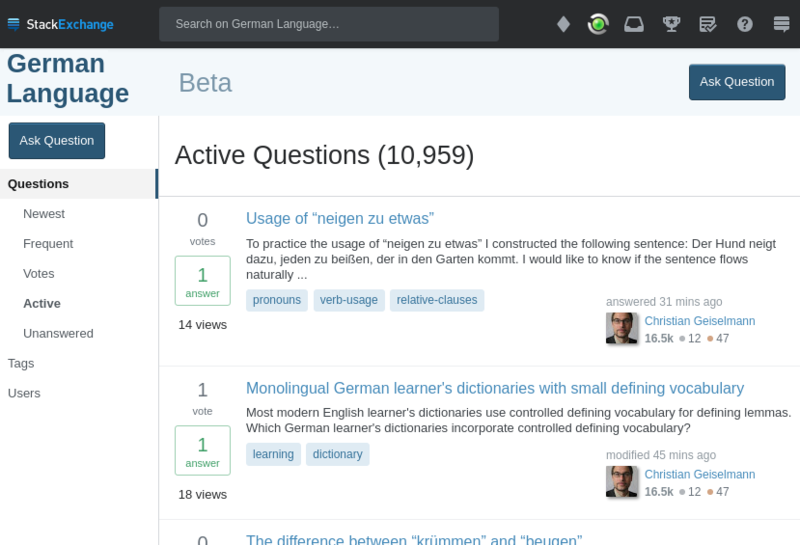 Newest, Featured, Frequent... go to a submenu on the "Questions" side menu entry. Even a dropdown could be considered there. 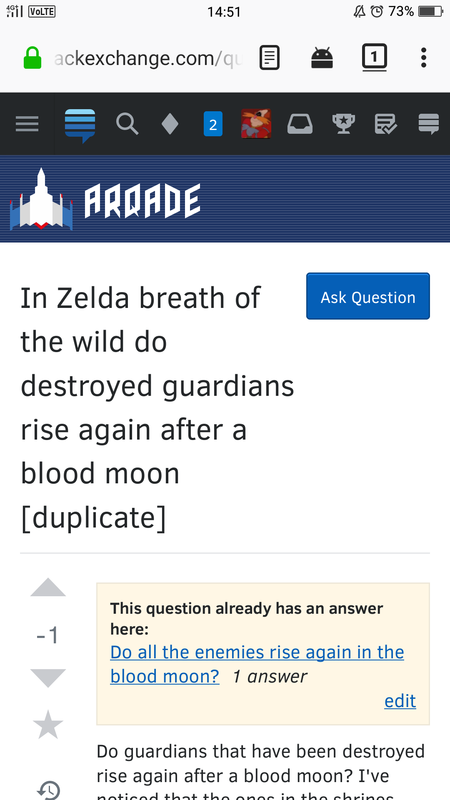 The Ask Question button moves to the side menu where it would be sticky too. A good place appears to be e.g. directly under the site logo. 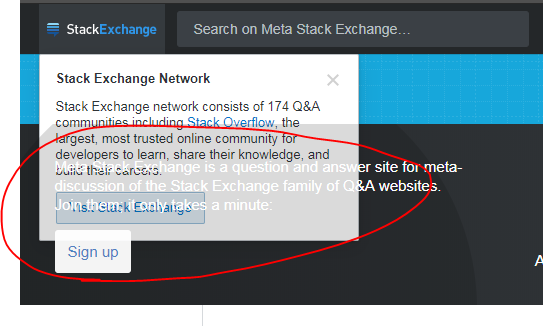 By this the Ask button is accessible from everywhere. An additional minor improvement was moving the search field a bit to the right to better align with the left side menu. 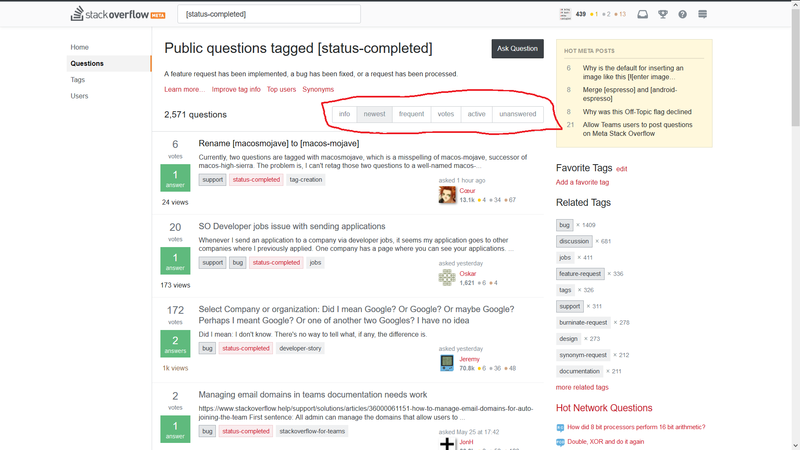 The "Ask Question" button now has a red border, red text and changes its background color to red when hovered over. I find this a little irritating because I associate red buttons with actions I should be thinking over twice before executing them because they may have dangerous effects (which asking a question is not, in my opinion). Is this on purpose so users think twice before they click this button? Or is there an other reason for the color change? I somehow liked the old black better and would like to know the reason for the change. The "unanswered" page of any tag, e.g. 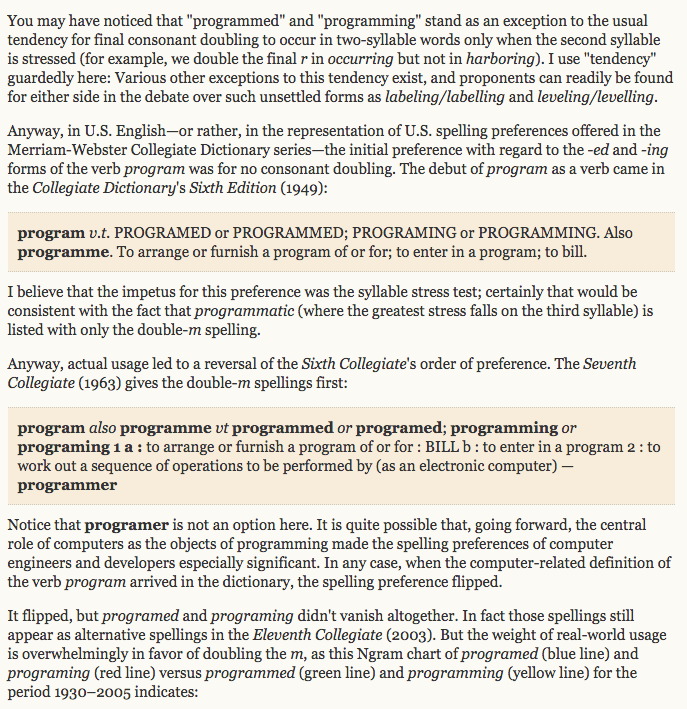 c#, doesn't contain the tag definition part. Why twice the "all questions"? Why are "featured", "frequent" and "active" gone? 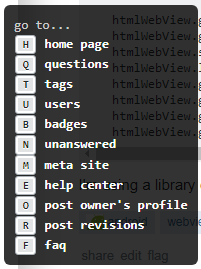 Why is only on unanswered the "my tags" visible? Why did "unanswered" get renamed to "no answers"? 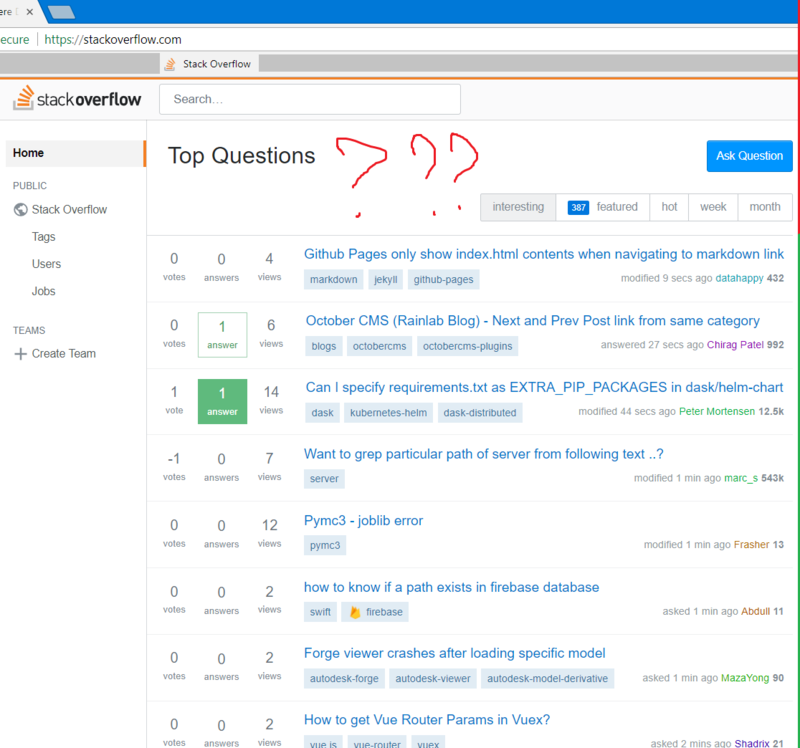 Why does https://stackoverflow.com/questions?sort=newest (and all other tabs, besides "unanswered") have two ways to go to "unanswered" the item in the tab and the separate button "Answer questions"? 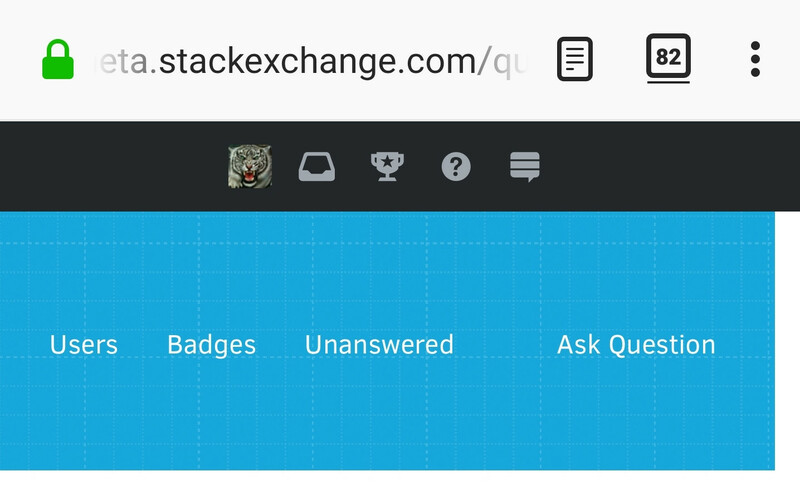 Because of this (I assume) there is also a rather unpleasant jump when switching around the tabs since the "unanswered" page doesn't have that button. 1. There's too much going on in the top bar. Can this wrap to another line instead? Potentially reduce the font size at mobile widths? We’re in flagrant violation of Bringhurst rule 2.1.2: Choose a comfortable measure. font. This is wrong on both serifed and sans sites alike. unreadable except maybe in a fixed-width face. The desktop line measure is still much, much too long for comfortable reading of continuous text in a variable-width font. This is wrong on both serifed and sans sites alike. We’re using lines 100 characters long, which is completely unreadable except maybe in a fixed-width face. which is completely unreadable except maybe in a fixed-width face. 2.1.2 Choose a comfortable measure. column work, a better average is 40 to 50 characters. 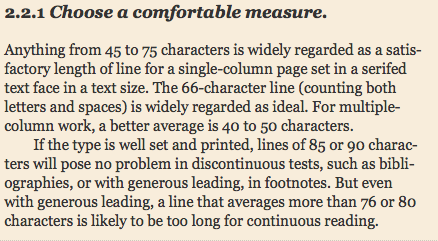 characters is likely to be too long for continuous reading. print edition of The New York Times. design, not the responsive design it’s purported to be. that makes it easy to read no matter the viewport. edit In the new menu there's only a very slight font color change, that I had to change my monitor settings for to be able to visually notice. Could a hover effect be added? Note, this is in the hamburger menu view. Please make the hover effect consistent with the other hamburger menus by adding a background color change on hover. There's a lot of whitespace in the top part of the page. I first noticed this on MSO, and filed a bug there, and was prompted to check out this thread by André Kool's comment there. Not sure what's the proper etiquette here, so I'm just linking to my original post instead of re-posting here. Is there some reason those links cannot simply be moved to the top, as in the case of other sites (such as Server Fault, in the below screenshot)? Do you have any statistics on how many users actually use those links in the left bar? By "use", I mean spend a reasonable amount of time on the target page, and not "oops, misclicked that, go back". 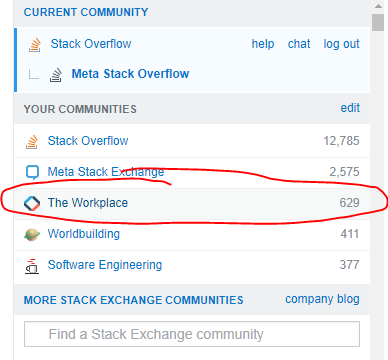 If I had to take a guess, 99% users (and that's counting all users who access the site, not just users who log in) have no need to frequently visit "Tags", "Users", "Jobs". 99.9% users have no use for the "Create Team" link since clicking on that leads to a paywall, which will almost always be followed by hitting the Back button (or equivalently, closing the tab/window). You probably don't need to put that many links in the left bar to pages that aren't frequently accessed. Of course, you have access to statistical usage data that I don't, so I hope you have already taken that into account. 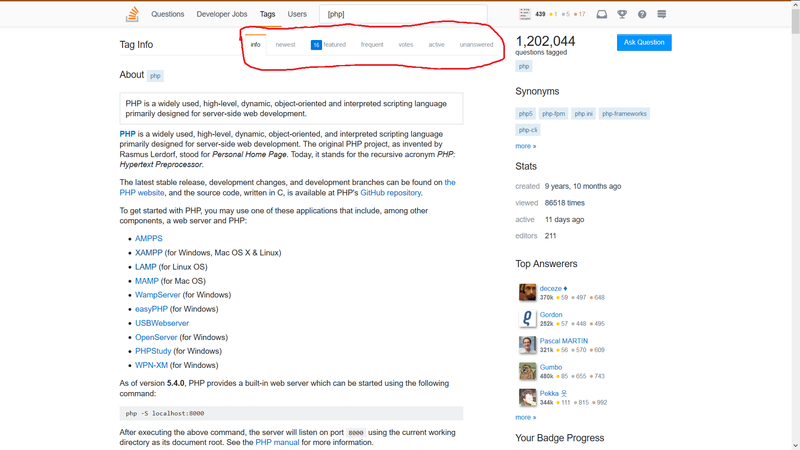 Also, there is absolutely no need for three links to Stack Overflow on the left bar. 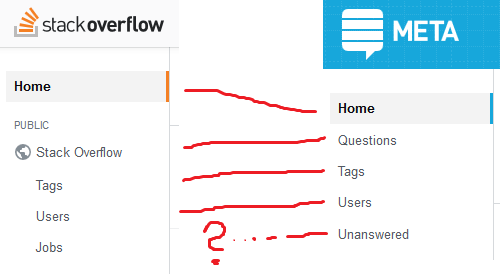 (Although one of those links leads to stackoverflow.com/questions, but that doesn't really make much difference.) You might consider fixing that as well. Moreover, since those links are already found at the bottom of the page, the left bar is pretty much redundant. There's also a fourth link to Stack Overflow there for some reason. When you disable the left navigation menu, you see a menu icon at the left of the top bar. That icon has a right border that doesn't fit with the other elements in the top bar. Could that border be removed? For me, when the left navigation bar is enabled, the content of the page is pushed off to the right, and a horizontal scrollbar appears. 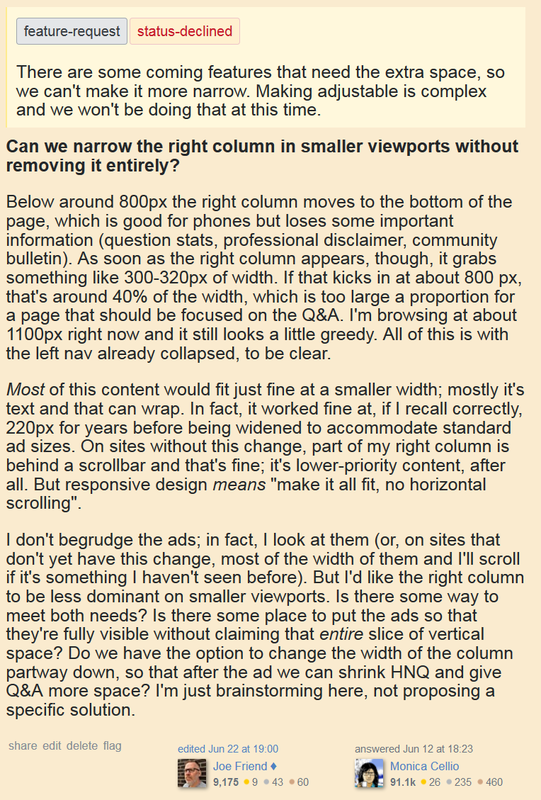 In other words, the width of the existing content to the right of the left navigation bar does not shrink in order to accommodate it. I am using 64-bit Firefox 60.0.2 on Windows 10. 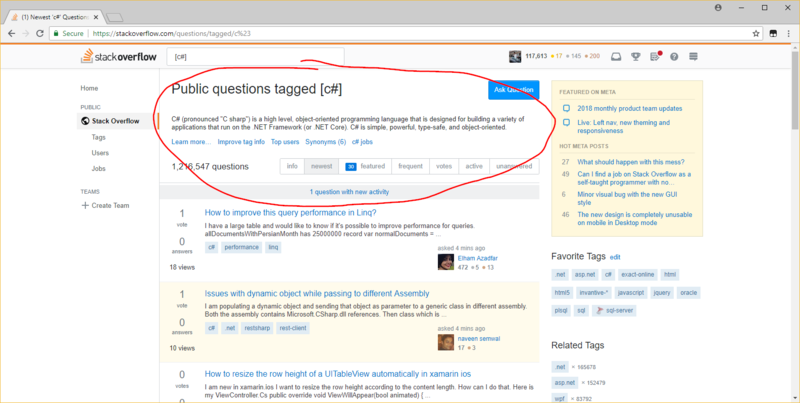 One more request about the tag questions page: can we have an option to collapse the tag excerpt and related links? I know the c# tag excerpt by heart now, I don't need to have it occupy 25% of the screen height. 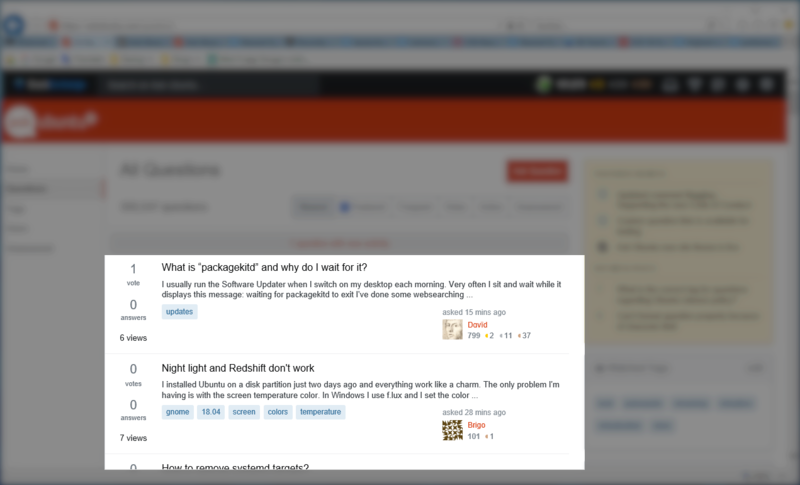 Can you make the "Hide left navigation" the default setting? 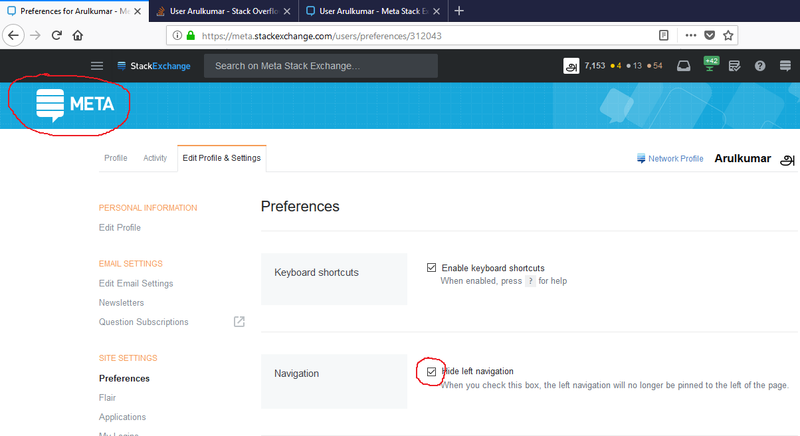 That way, users who don't login (including users who have accounts but use private browsing mode) don't have to see the left bar, and users who want to see it can always enable it from the settings. It would be transformative for regular users if the left-nav gave users customisation options such as by adding their own links etc., e.g. 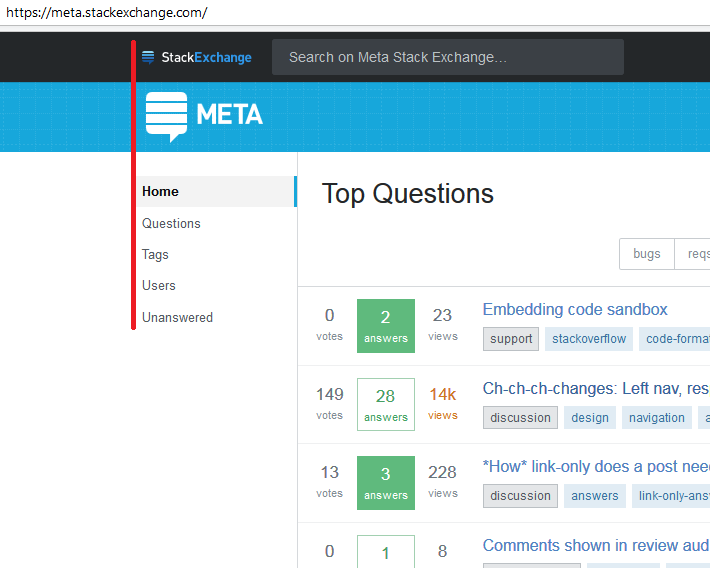 for meta, favourite chat rooms, the ability to pin questions by dragging them to there, the things they use most. Then it would become a joy to use. Failing that it's at least be better the user has the ability to hide it, as it fills a lot of prime real estate with empty white space. But it should be clear on it, that it is, by some pin or x in the corner, rather than hidden elsewhere. Not the answer you're looking for? Browse other questions tagged discussion navigation responsive-design .